This is a reference work on Christian counseling, a book length bibliography of authoritative works explaining the solutions found in the Bible to the problems of everyday life. The collection included audio cassettes, video cassettes, booklets, theses, and other resources. Approximately 5700 works by 2100 authors appear is 414 topical listings. Includes indexes. This annotated bibliography presents the work of 2100 authors. Biblical Counsel is a "book length bibliography of authoritative works explaining the solutions found in the Word of God for the problems of everyday life." Steven Kettler has compiled references to almost 6,000 works (from 2,500 authors), including books, audio and video tapes, pamphlets, sermons, software, journal articles, and newsletters. Many of the citations are annotated with a brief description of the contents. This book's intended audience is roughly the same as that of the Journal of Biblical Counseling, "persons involved with helping others: all Christian workers, pastors, elders, deacons, Christian counselors, lay Christian counselors, Sunday School teachers, and youth workers. Physicians, medical professionals, social workers, psychologists, psychiatrists, financial consultants, nursing home workers, and managers will also find it useful." The title--Biblical Counsel--makes a significant commentary on contemporary views of people helping other people. Kettler recognizes that "counsel" is a far broader term than "counseling," as that later word is usually understood in the twentieth century. There are vast resources of wise counsel that ought to be brought to bear for counseling to be worthy of the adjectives Biblical and Christian. Kettler includes many classic books on theology, Biblical exegesis, prayer, small groups, evangelism, preaching, and Christian living. Kettler seeks to draw from historic, orthodox Christianity. His sources span the centuries, from Augustine to Jay Adams, from John Bunyan to John MacArthur, from B.B. Warfield to Martyn Lloyd-Jones. All references are to books in English. He lists numerous audio tapes and books by Biblical counselors from the National Association of Nouthetic Counselors and from the Christian Counseling & Educational Foundation. His orientation is heavily toward nouthetic Biblical counseling and toward Reformed theology. But he casts a wider net, disclaiming that he agrees with every author's views and disclaiming that authors always agree with each other. He includes references to a number of integrationist counseling approaches: e.g., Steve Arterburn, William Backus, Gary Collins, Fred Dickason, and E.L. Worthington. And he cites from a number of non-Reformed evangelicals: e.g., Billy Graham, Charles Stanley, Chuck Swindoll, and A.W. Tozer. The first three chapters are the heart of the book (and fill about 400 pages). Chapter One, "The Foundation of Biblical Counsel," cites classic Protestant and contemporary works on theology and the means of grace. Contrary to the popular self-help psychologies of the 1980s and 90s, wise counseling expresses a comprehensive theology and a comprehensive vision of church life. How many counseling books even care about the category "Book Length Presentations of the Gospel Message of Salvation" or the 50 listings under that topic? Chapter Two, "Biblical Counsel," helps readers to pursue special counseling interests. It arranges sources under some 100 topical headings, including crisis counseling, apologetics, affliction, anger drug abuse, sin, worry, homework, physiological problems, and so forth. Under some headings, where there was little if any Biblical counsel in print, Kettler listed other sorts of works, secular or semi-Christian, in order to prime the pump for discerning readers. Chapter Three, "Special listings," contains about 30 pages of annotated listings of Puritan practical works as well as 30 pages of conservative Bible commentaries "containing Biblical counsel." It also lists the complete works of Jay Adams, Martyn Lloyd- Jones, John MacArthur, J.I. Packer, Charles Spurgeon, and Charles Swindoll, among others. I found that Kettler had about ninety percent of Jay Adams' books and pamphlets contained in the bibliography in this issue of JBC. . . .
BIBLICAL COUNSEL chooses books that are vigorously Protestant, vigorously practical, and vigorously English- speaking. The literary genre, annotated bibliography, is usually associated with scholars. But BIBLICAL COUNSEL will be of more interest to practitioners than it will to scholars, both because of the strengths and the limitations of Kettler's purposes in selecting, arranging, and annotating. Kettler's system of numbering books merits a word of explanation. It is not immediately obvious to the reader and is not explained in the text. Once explained, however, it is straightforward. Kettler assigns each book a five digit number. The first digit identifies the chapter in which the book appears with its full bibliographic information and, often, with an annotation. The last four digits number the books consecutively through that chapter. For example, item 30468 appears in Chapter Three as the 468th new listing within that chapter. (30468 happens to be the "Journal of Biblical Counseling.") Many items are listed in several different places. When a book has multiple listings, the reference number is placed in brackets in each of the secondary listings. So Jay Adams' WHAT DO YOU DO WHEN YOU KNOW YOU ARE HOOKED? has its primary citation in Chapter 3 as 30100 among Adams' collected works. But it also appears in Chapter Two under the topic Drug Abuse as . If you had first encountered this pamphlet in Chapter Two, you would know to look at the 100th listing in Chapter Three to find the full citation. One wrinkle in this system is that books that first appear in Chapters Ten and Eleven are assigned six digit numbers, and the first two digits (either 10 or 11) identify the chapter. The book contains a complete index of authors, titles, and reference numbers--almost one hundred pages. . . . This book contains 5700 works cross-referenced under 414 topical headings, and this reviewer has not checked them all out, nor if he had would he be able to evaluate the character of such a mass of works. Chapter 1 has a list of the basic books in this Bibliography, and makes interesting reading, although there is a significant weight in favour of some which surely must be of only limited interest. However, having said this, it is a fair conjecture that anyone seriously interested in Christian reading will find this book fascinating reading and essential to have. You won't ever have seen anything like this in your lifetime. Under the 414 topic headings, you will find no less than 5,700 works, cross-referenced for easy access. Many of the works have pertinent and helpful comments under the title. There is an author index in addition to the listings under the 414 topics. This bibliography is right up to date, giving recent publications as well as the older ones. There is a Scripture index, and also an index of subjects. Among the topics are commentaries, classics, biographies, small group resources, counseling books, master listings of works by noted authorities, including books endorsed by them, an unusually large listing of books on the teachings, counsel, and sufficiency of Christ, books that deal with Christianity in the workplace, works exposing modern myths, and a listing of the best books both in print and out of print. The authors list reads like a Who's Who in Christian history, right up to today's authors. Included are the titles and comments of Cyril J. Barber in the 2-volume set, THE MINISTER'S LIBRARY. In using this extensive bibliography, Kettler suggests that after selecting a subject for study, it is a good idea to go to the Scripture index and note down the Scriptures that deal with that subject. Librarians, especially church librarians, will find this book very helpful in ministering to readers, referring books to the readers that deal with the subject they are interested in studying. There is an excellent page telling one seeking God how to become a Christian, and this is followed by a 3-page listing of excellent books that should be helpful in such a quest. 5. 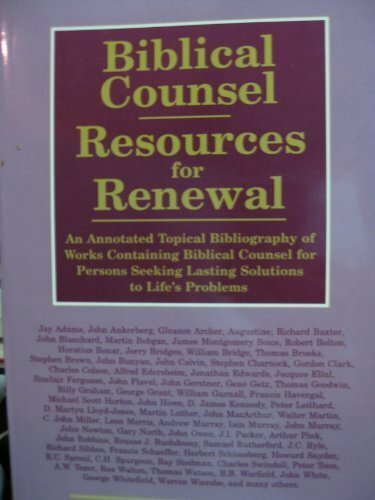 Biblical Counsel : Resources for Renewal : An Annotated Topical Bibliography of Works Containing Biblical Counsel for Persons Seeking Lasting Solutions to Life's Problems Kettler, Steven C.